Hello everyone! It kind of surprised me when I discovered I had never done a post on my blogging story so I decided to share that. When I was 7, I used to write up a small newspaper that I shared with my class. Then, my dad created a blog for it and I thought it was the best thing ever. Eventually, I stopped posting and deleted it. Then when I was 9, I created an AG blog which became pretty popular but I stopped posting and then I deleted it. Then once more, last year, I decided I would try writing a blog once more. This time I would take it a little bit more seriously. I got inspired by several bloggers Kids Blog Club and Call Me Hannah. I was originally going to write about world problems but then I read some more blogs and realized that I should write about my true passions and how I really feel. My perspectives of the world. My blog got bigger and bigger and now, after 8 months of blogging, my blog hasn't lost its power and I hope to continue blogging so I can look back at my feelings and my passions when I grow up. I'm still not brave enough to tell my friends about my blog because I'm sort of nervous to hear what they say. But I don't need to tell them, I'm happy. I was going to make up a story because I didn't really know and I was embarrassed by my true story but I realized that I have to be honest, to teach myself. And I'm proud, of myself and what this blog has become. Sorry that this was post was so long, I just needed to tell the true story and all of it! Hello everyone! 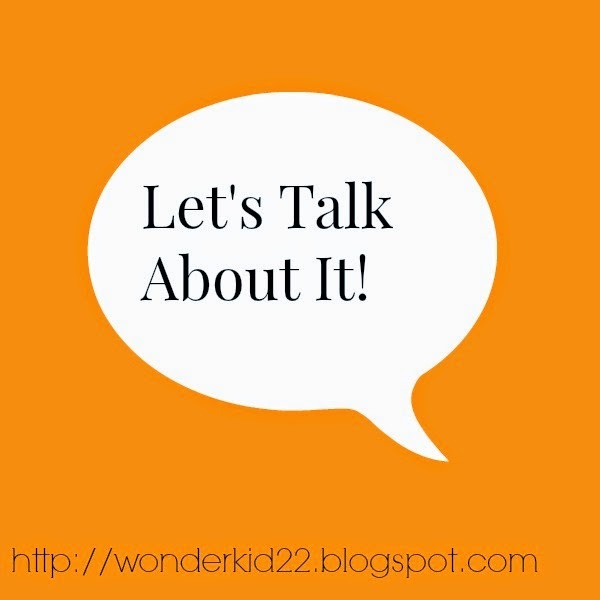 Today I am taking a break from Halloween stuff and starting a new series called "Let's Talk About It". Its basically a mini-talk show with blogging news, news, events, and stuff like that. I'll try to do one as a filler so they won't be here super often but if you like it then tell me! EBOLA: Is it a Threat? If you live in anywhere but Africa, no. There are around 5 people in the US who probably have Ebola and they have been quarantined. If you live in Texas, or New York and are scared of Ebola, don't be. There is a veryyyyy small chance of you actually getting it, so it is not a problem to you. On the other hand, Africans have a higher risk of getting Ebola. Thankfully, it is going away, but many people still have it. So if your thinking of going to Africa, also think about cancelling your trip. 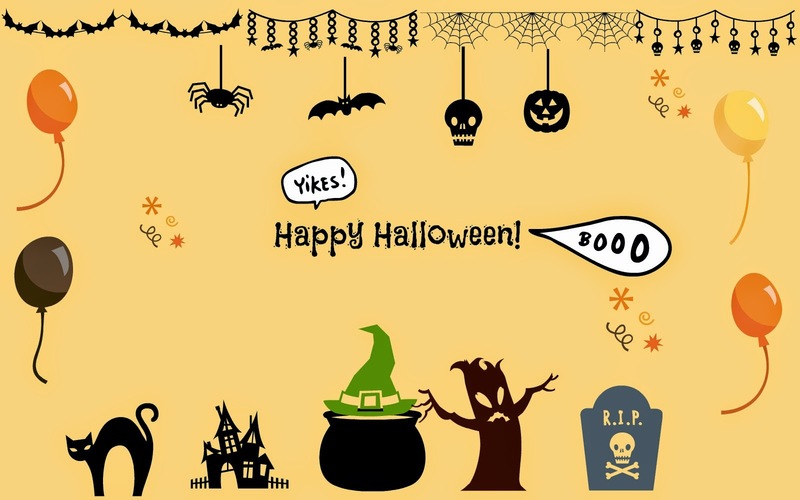 What is the big deal about Halloween? For most kids who celebrate it: candy, friends, and costumes. For me, its candy, friends, and costumes. I love candy. When I grow up and don't go trick or treating, I'll still buy candy for myself. Friends are a big part of Halloween. I go to my friend's houses for parties and then head out for a night of fun. I also love dressing up in costumes and expressing myself. Basically, everyone loves having fun on Halloween. 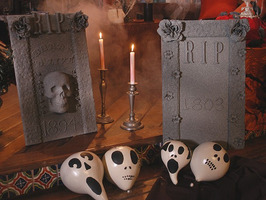 A lot of people don't even know Halloween was originally for scaring spirits off. One of the best ways to get your blog popular, is to host a contest. Everybody loves contests or giveaways. It gives them a chance to get something. I will do every entry in the giveaway so I can win! I hope you enjoyed this little news post and comment if you want more!! Hello everyone! 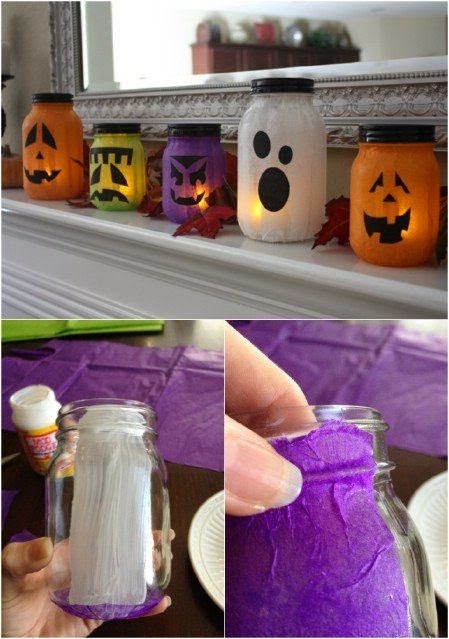 I know, I've been doing a lotttttttt of Pinterest idea posts but they are just soooo cool and fun. I've decided to post some ideas of décor that I am planning to do and how I might be doing it. Saturday's post will be a transition into the exciting posts for next week which you will find very exciting because these are the secret posts. Can't wait to see what all the bloggers have planned for next week! I personally love the banner. 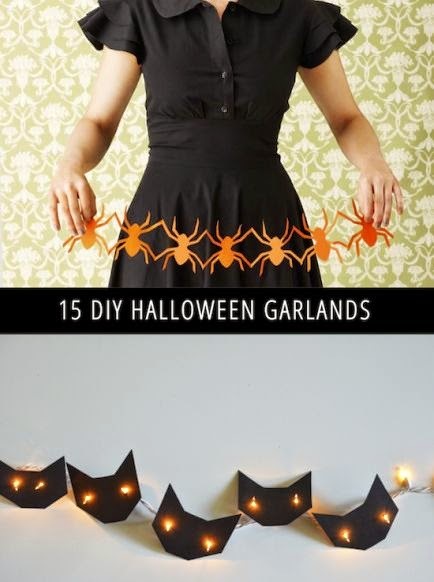 My grandma has some fabulous orange ribbon that would work perfectly for this project. The pumpkin is cute too. 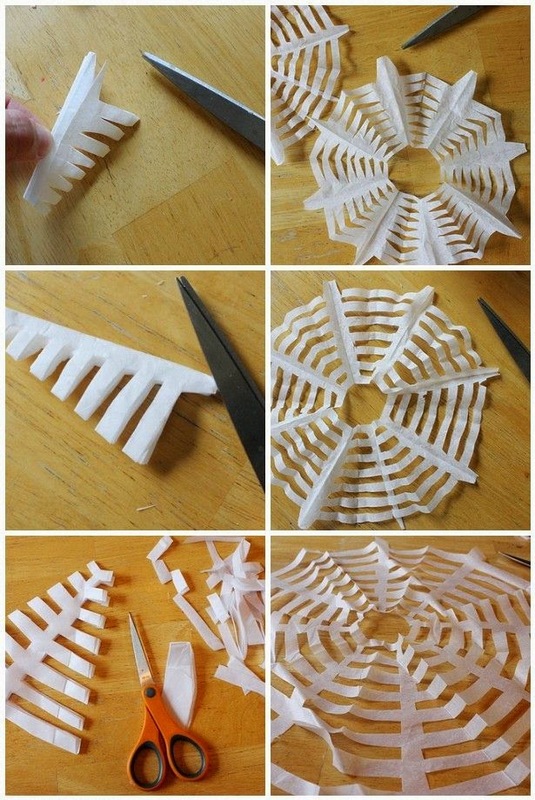 This looks super simple and can be done with paper, string, and imagination. 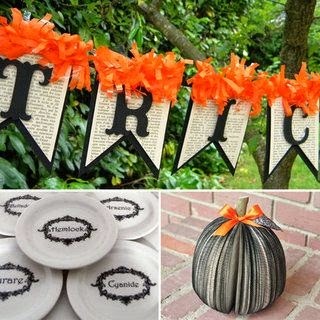 I will probably use black, orange, and white paper and maybe use some candy corns too. These look simple to make. Cardboard+ gray paint+ painted roses and letters= tombstone. I hope you all enjoyed today's post as much as I did. Next post, I'll try to talk about costumes so be sure to tell me about your costume and I might feature it next post!! Hello everyone! Remember how I said that I would be including some AG stuff. Today I am going to share some Halloween stuff for AG so this is one out of 2 posts. 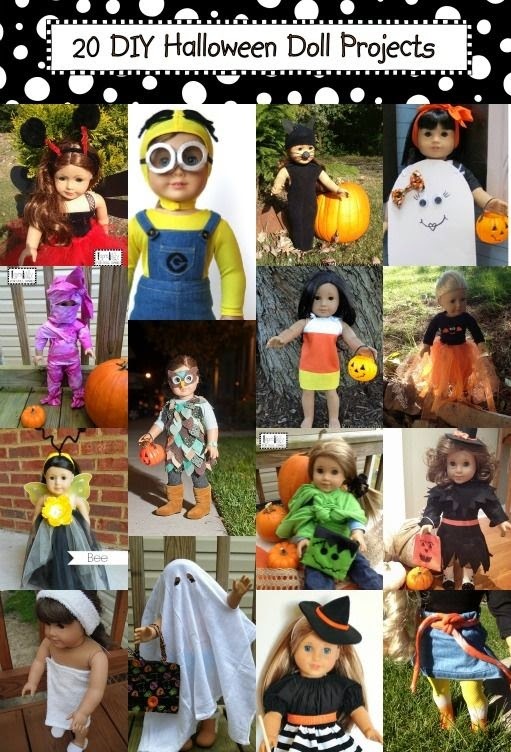 Next week, I'll post about Alisha's Halloween so here are some AG Halloween ideas for ya. This one is cute! I really like this one. It is also really easy to do. 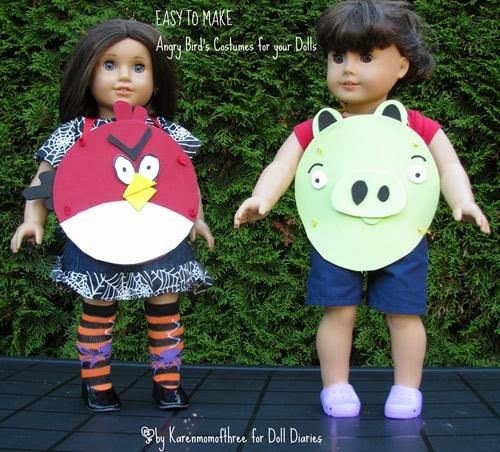 There are soooo many ideas for costumes and all of them are super cute. Link is here! 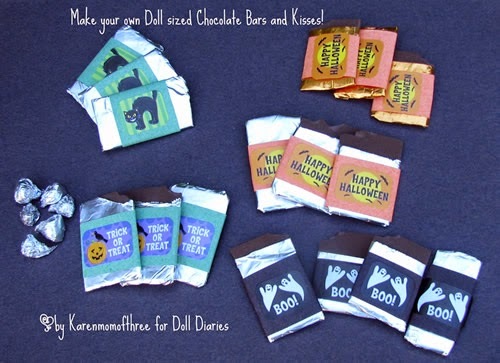 These are super cute and easy to make! Find the tutorial right abouttt, nope not yet....here..
Doll Diaries is a good website for doll things and this is a fun tutorial. Linkie! Hello everyone! Long time no post! 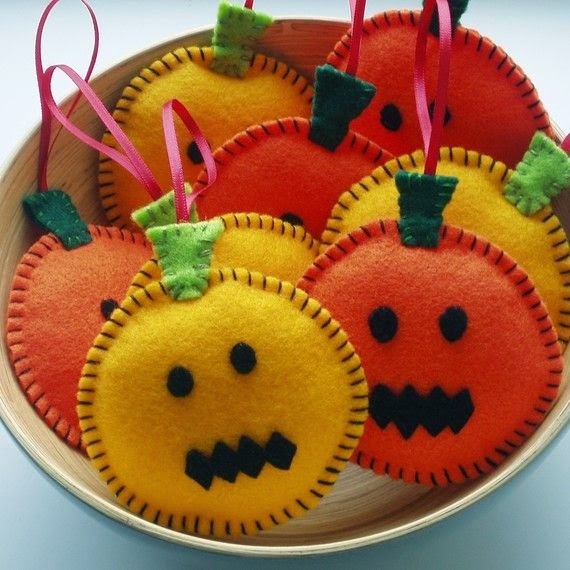 Today I am going to be doing a craft from the ideas which is the felt pumpkin. I was really lazy so mine didn't turn out great. 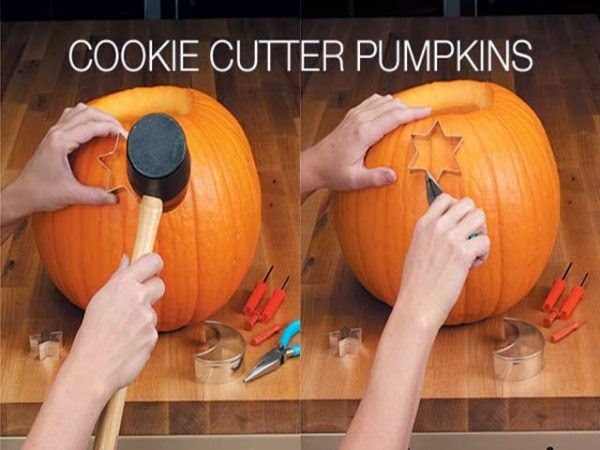 So obviously, the first step to making pumpkins is cutting the circles. 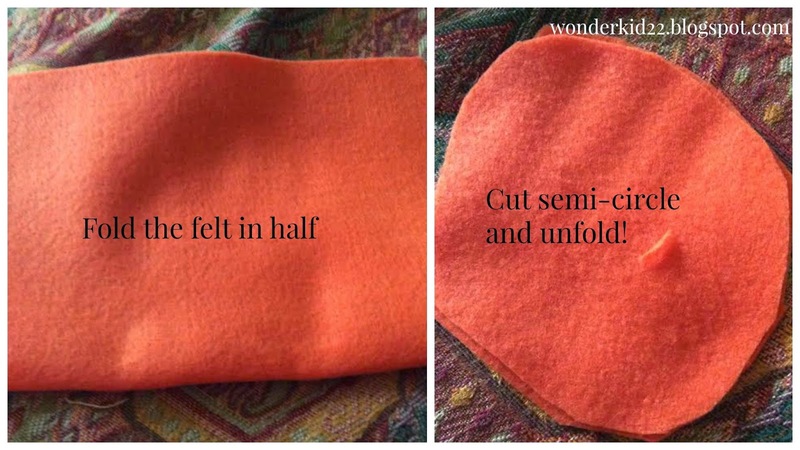 My trick is to fold the felt in half and cut a half-circle on the fold. You will need two of these. Now, this "pumpkin" looks like a big orange blob right? We need to add a face to this pumpkin. 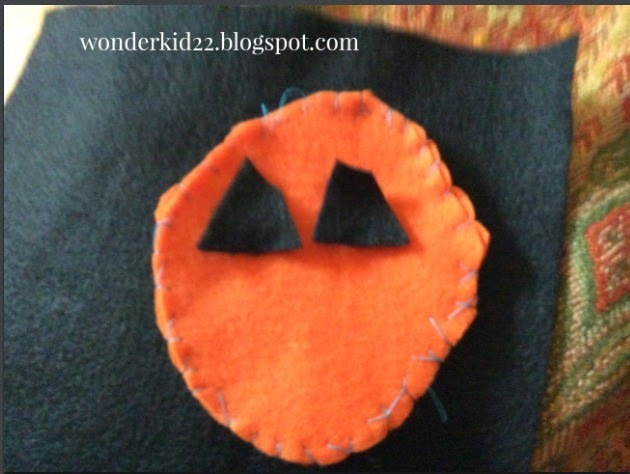 Use your black felt and cut out 2 triangles, squares, or circles for the eyes. 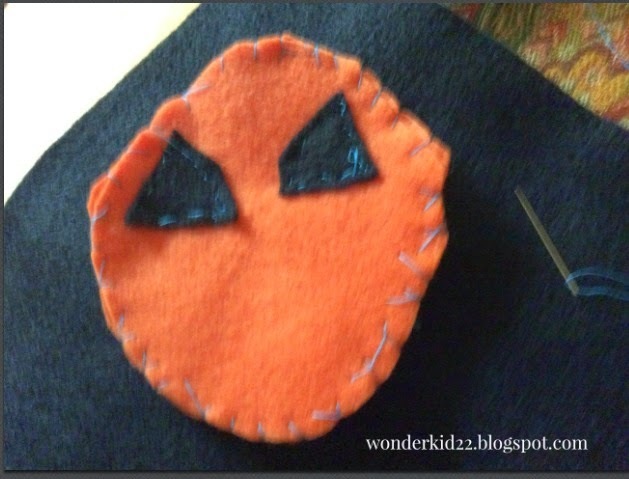 Now, we can use a simple running stitch to sew on the eyes. The mouth is fun because you can cut it in any shape and size. Since I am lazy, I cut my mouth into a circle. 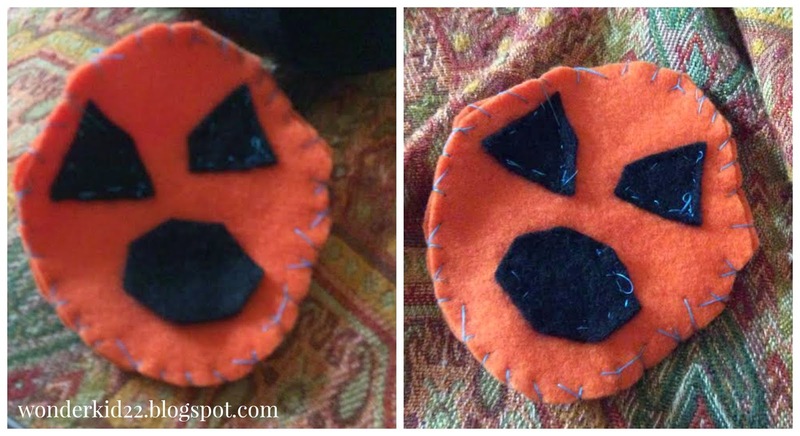 Now you can hang, cuddle, or place this pumpkin and have fun with it. I hope you enjoyed today's craft and I will write again on Tuesday! Hello everyone! I know, you were expecting a craft but I didn't have time today. I am going camping this weekend so I will not be posting on Saturday but Sunday and Tuesday. I'm sorry about that! Today, I am going to be doing to do a quick "Update" post that I've done before. Writing...A compare and contrast essay for Language Arts. Thinking...About all the things I have to do tomorrow. Excited for...GS camping this weekend. Sorry for the short post and I hope you enjoyed and wasn't bored! Hello everyone! Don't worry, I didn't forget about the post today! 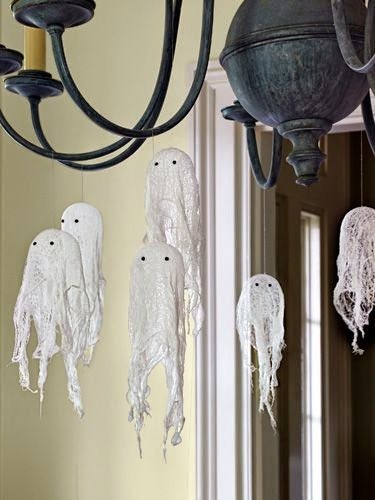 Today I am going to share some super cute décor ideas that I found on Pinterest. Tell me in the comments if you would like a tutorial. 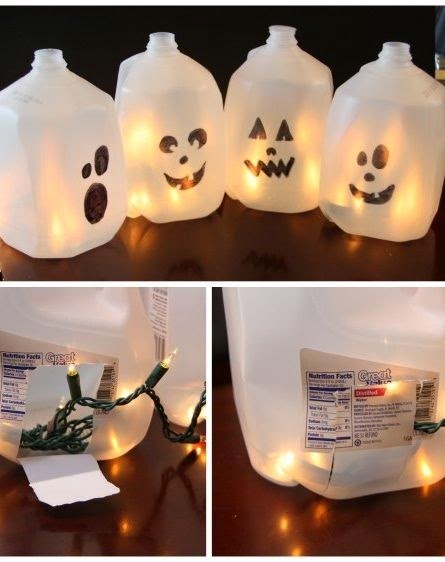 This looks easy to make and I bet I could do a version with ghosts and fairy lights. Comment "1" if you would like this to be a tutorial. 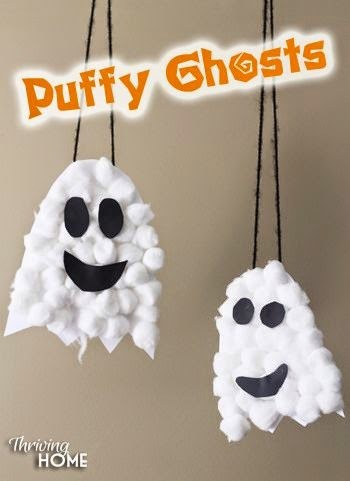 This is super adorable and is easy to make. 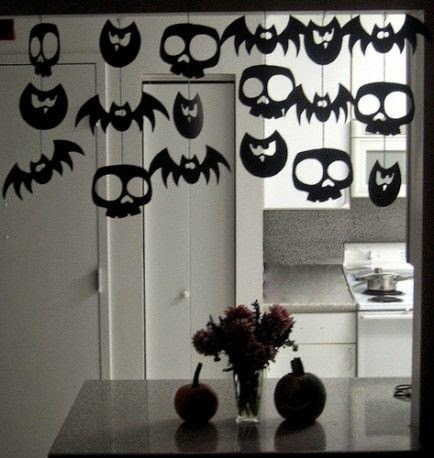 It would look great hanging from the door. Comment "2" if you would like this to be a tutorial. This one is pretty self-explanatory but if you want this one the be a tutorial, comment "3". I've seen this one before and I've always wanted to do it. I'd just have to gather up some milk bottles which might take quite a while. Comment "4" if you want a tutorial. Oh my stars, I could put like cinnamon smelly stuff in there and it would be so cool! Please comment "5" if you want this to be a tutorial. I couldn't really find anything else but if you do, comment the link and I'll see if I'm able to do a tutorial on this! :) I love your opinions and don't be afraid to share!! I hope you enjoyed and I'll try reallllyyy hard to post tomorrow using your ideas! Hello everyone! Today I am doing a Sunday Showcase after such a long time. I've decided to tweak it a bit and do a Sunday Showcase but by post topics, so 2 posts per post topic. I loved this post written by June! It was a goals post and it inspired me to write my goals post. 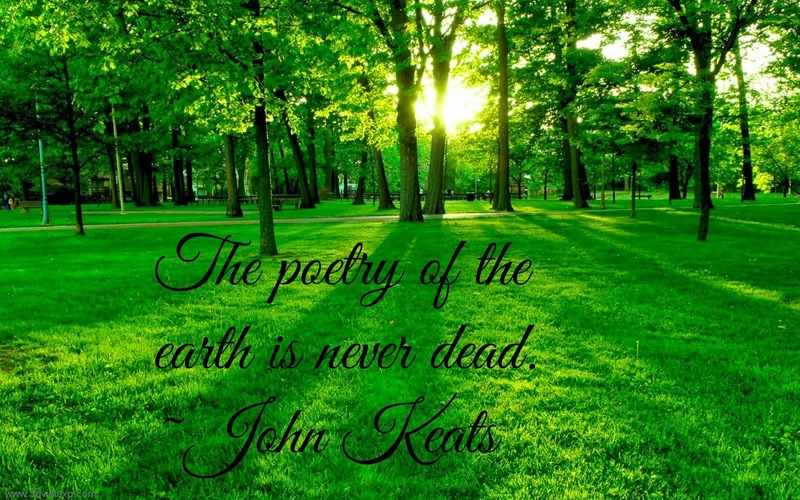 Check out the fabulous post here. Barbora at A Bit Confusing recently posted this fun photo post with her friends which made me smile! Check out the sweet photos here. I thought this post was really cute and saw all the doll sized and adorable things that Claire put in her dolls' room! Check out the cute post here. This was an old post but I loved reading all of Eve's answers and learning about all the new tags out there. I was even tagged for one of these and will be posting it soon. Find that post here. Gemma Rose of Gebbles Writes took a trip to Canberra and posted this awesome post full of fun pictures! To see all of the fun she had click here. Sorry for the short post, I am typing this at 9:30 at night and cannot focus very well. Comment down below if you have any fun posts you loved and I might just feature them next week! Stay tuned for tomorrow's adventure into Halloween month! Hello everyone! 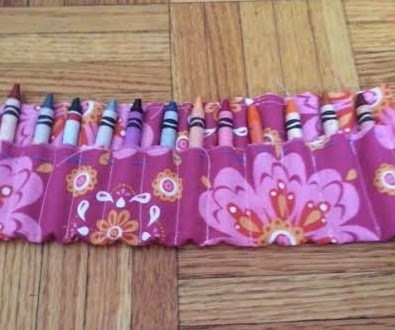 Today I am going to be teaching all of you how to sew a crayon roll. I saw some pics on Pinterest on how to make them but I decided to come up with my own tutorial. BOOM! For the Scary Month of Halloween, 3 spots have been taken up by Lauryn, June, and Livy. Please make sure you follow the requirements! Posting for the party will start Monday, my next post. 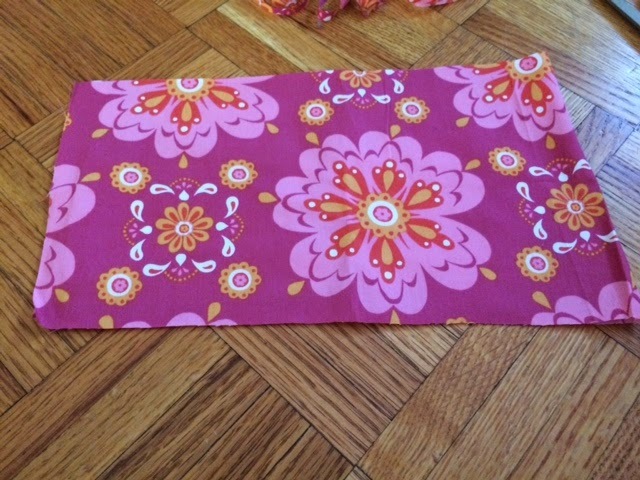 The first step is to cut your fabric. This is what mine looks like. (Dimensions above) Cut two pieces. 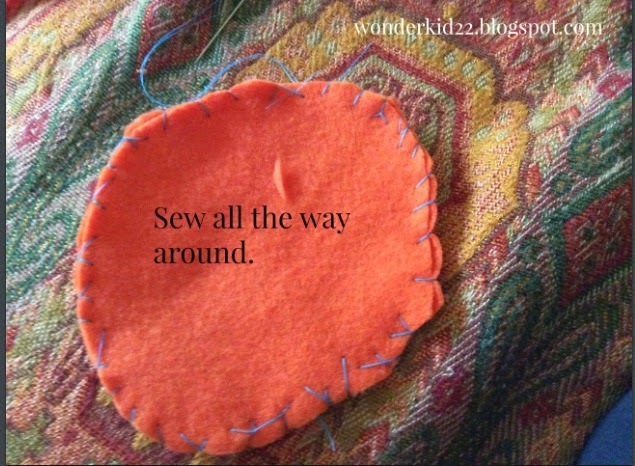 Now, sew along the yellow lines. Don't worry about the red line yet. Sorry about the lines. Sorry for the bad picture. Fold up the side that had the red lines from the last diagram. Don't fold up all the way, leave a couple of inches of space. 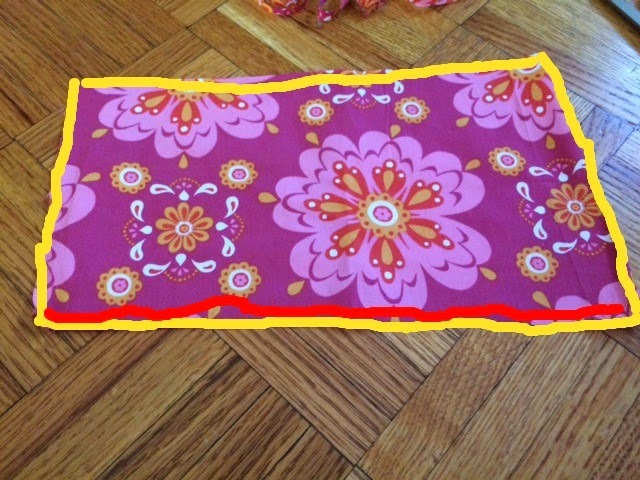 Okay, now sew along the yellow lines or close enough. You should have little pockets. It should look something like this. 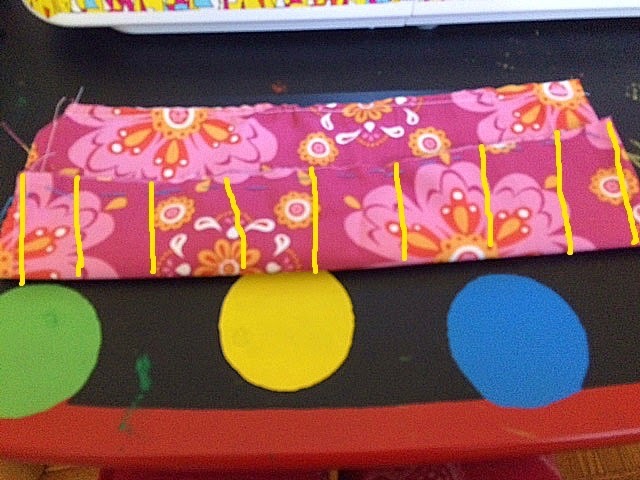 I had 15 pockets but it depends how far you sewed your lines. 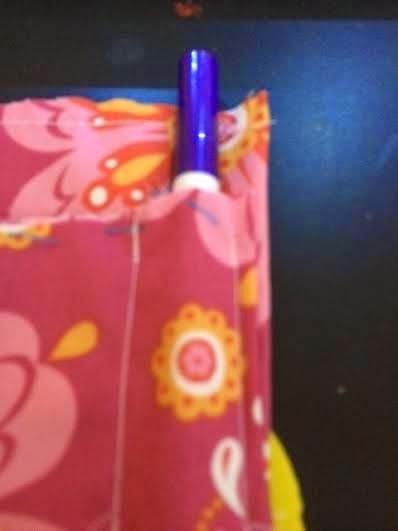 Your pockets should look like this. I used a marker to demonstrate. ﻿Now stick some crayons or mini markers in it and bam! 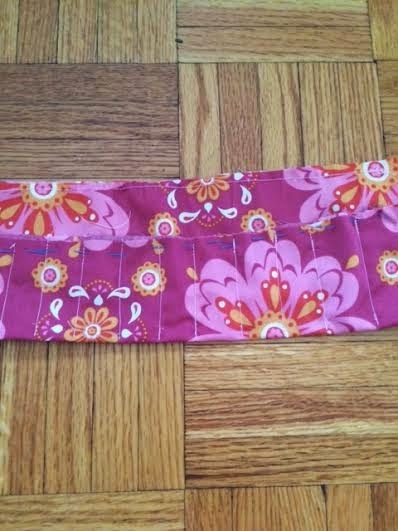 Now, you can roll it up and secure it up with a hair tie or rubber band. Perfect for school! I hope you enjoyed today's craft and get excited for Halloween posts next post!!!!! 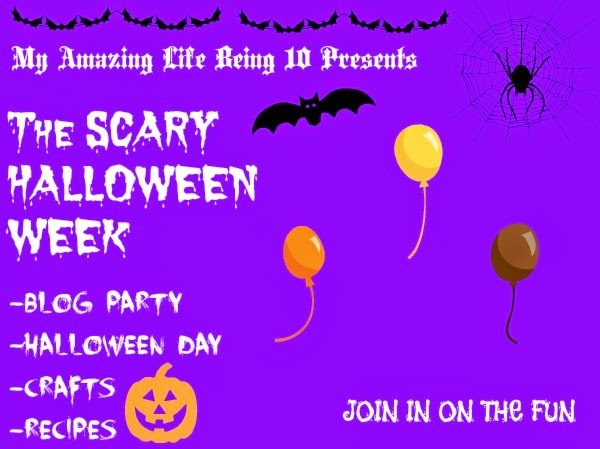 All the information for this fabulous new thing is in a page named Halloween Month! I still have 5 spots open for the blogger thingy. Let's get to the weird edits I did. This is what's called: "going overboard". Hello everyone! Today, let's learn about my life. Why, because you weird (Jk) people requested it, I'm kidding you are fabulous. But still, why did 6 people request my life? God knows. So I'm gonna do an FAQ about me and anyone of you can do it to! Noor 13th Doctor, of Gallifrey. Q- How old are you? Q- What sports do you play? Soccer and swim! I'm number 17 BTW. Q- Why did you start this blog? To share with people my life and different fun things. Q- What fandoms do you belong to? I'm a Whovian, Sherlockian (I don't know the correct name, sorry! ), Demigod, Tribute, Potterhead, Divergent, and a Pokemon Trainer. LOOK AT ALL DEM FANDOMS. Q- What are you going to be for Halloween? 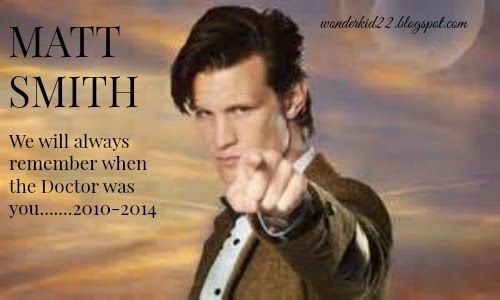 The 11th Doctor! I have a Fez (which I sorta lost), a Sonic (which I sorta lost), and a bowtie (which I didn't lose). I AM THE 11TH DOCTOR NOW, 11TH DOCTORS ARE COOL. Q- Do you have any social networks? Q- What langauges can you speak? German, English, Urdu, and Bangla. Q- How long have you been blogging for? 8 months! My blog anniversary is coming up soon! Q- What are your favorite things to do in your spare time? Fangirl, text, read, write, blog, read blogs, internet surf, and do boring homework. Q- Did you get into the Mathalon? OOOOOH! I've been planning this for quite a while and its actually going to be the whole month of October with special things in the final week! -I'll be having a blog party with 4 or 5 bloggers so if you are interested in that be sure to comment or email me. I'll be giving out up to 7 spots, 3 at the least. -I am also doing a bunch of crafts so tell me if you want me to do that. 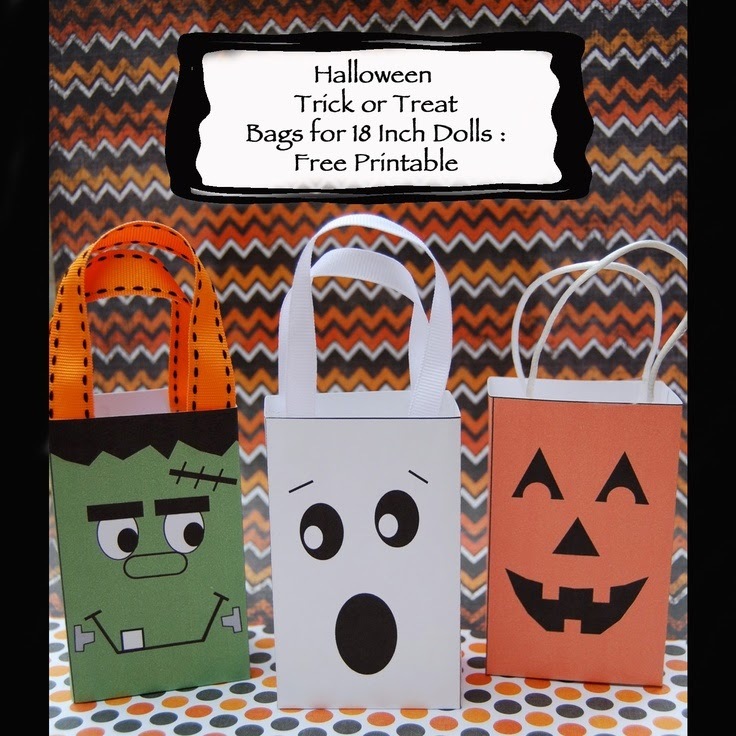 -Guest posts are also available at this time if you want to make it based on Halloween! Hello everyone! Today, we are going to discuss..... tweens. Tweens are girls who are almost teens so 10-12 year olds. See if you can match up with any of these! -Tries to look pretty. I do this, I have panic attacks sometimes about my appearance so I spend an hour getting ready. It doesn't happen all the time but it does happen. -Has a BFF. Or at least someone who you call your BFF. This girl cares for you and knows ALL of your secrets. Shoutout to my BFF, Farah! -Has a hobby. Whether it is drawing or taking selfies, every tween girl has a hobby. -Takes about 2-5 selfies a day. No joke, girls at lunch are taking selfies allll the time. STOP WITH THE 1000000000 SELFIES! -Has an Instagram. I have an Instagram, and I obsess over it. But, I share stuff with my friends and you guys so its not a big deal. But some of my friends have Instagram and post selfies, but don't make their Instagram's private.